Straight/gently curved channel that dissects the convex bend of the primary channel, short-circuiting the bend. This chute then becomes the primary channel. 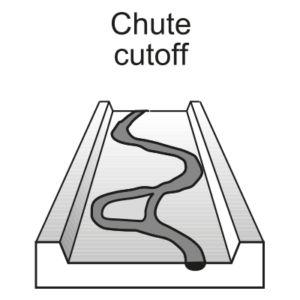 Chute cutoffs have a straighter planform than meander cutoffs. They generally fill with bedload materials. Represent shortening of stream lengths or decreases in sinuosity of the channel, steepening the water-slope at flood stage. Concentrated flow with high stream powers are able to cut across the bend. Chute cut-off enlargement may result in abandonment of the bend and the chute becomes the primary channel. The old channel bend is filled mostly with bedload deposits. Chute cutoffs generally occur in higher energy settings than meander cutoffs.